Ornithology is a series of work that explores moving images within physical machines – working with the form and structure of how animation is made. The film itself is constructed from collaged 18th and 19th Century natural history illustrations – multiple frames of still birds combined to form a single bird in flight. Uncovering a type of hidden movement between each still frame, patterns of the birds’ behavior emerge when played through time. The series began while Fontanive was studying at the Royal College of Art in London in 2004. At that time he collected Victorian clocks from the street markets in East London. He used the clock parts and other found objects to invent the machine that drives the animation. 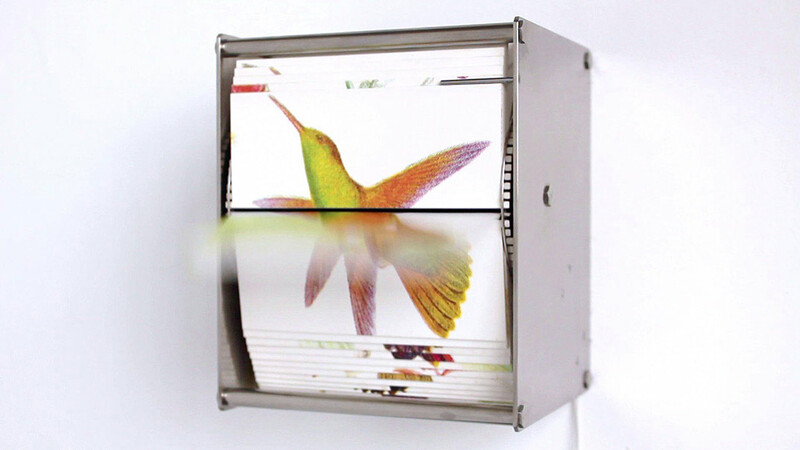 Designing the mechanism over time, the bird animation and machine have informed each other in their development – the wings hinging like paper, and the paper cards flapping at the rate of bird’s wings.